Three new safety colors have been added to the HiGlo-Traction line of products: Glow Safety Yellow, Orange and Lime. 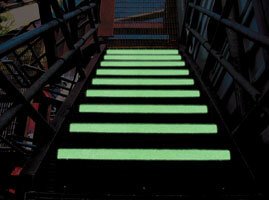 The covers work for steps, walkways and ladder rungs, and can be fully recharged with only five minutes of direct sunlight exposure, eight minutes of exposure at dusk or 10 minutes of exposure in florescent lighting. Charges last for no less than 12 hours.